Driving Lesson Videos Instructional videos showing how to master some of the key driving test maneuvers. Show Me, Tell Me Advice Everything you need to know in order to pass the Show Me, Tell Me section of your driving test. Understanding the correct use of bus lanes is really important part of taking your driving test. If you don’t follow the rules correctly it may cause you to fail your test. This page focuses on understanding some of the signs you may see relating to bus lanes. Its important to remember that the following photos and video are just examples of what you may see and that you must always observe for yourself and make your own decisions. Every road is different so don’t make any assumptions, its vital that you read all road signs so that you can be aware of any approaching hazards. 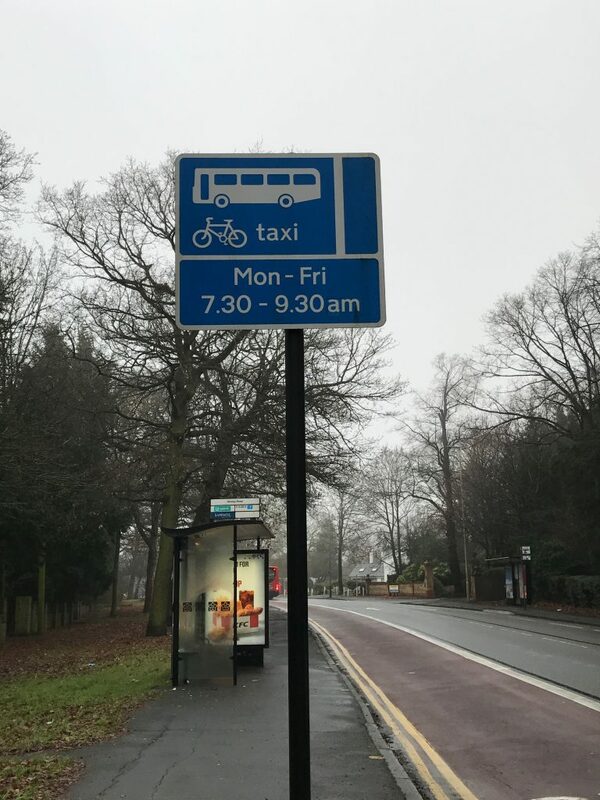 This sign informs road uses that only buses, taxis and push bikes are allowed to use the bus lane between the hours of 7:30-9:30am Monday to Friday. Outside of these hours you would be expected to use the bus lane when possible. If you find parked vehicles in the bus lane move back to the left after you pass the parked vehicle. The idea is to let faster moving traffic overtake in the right lane, failure to use the bus lane can result in you failing your test so read the sign carefully. 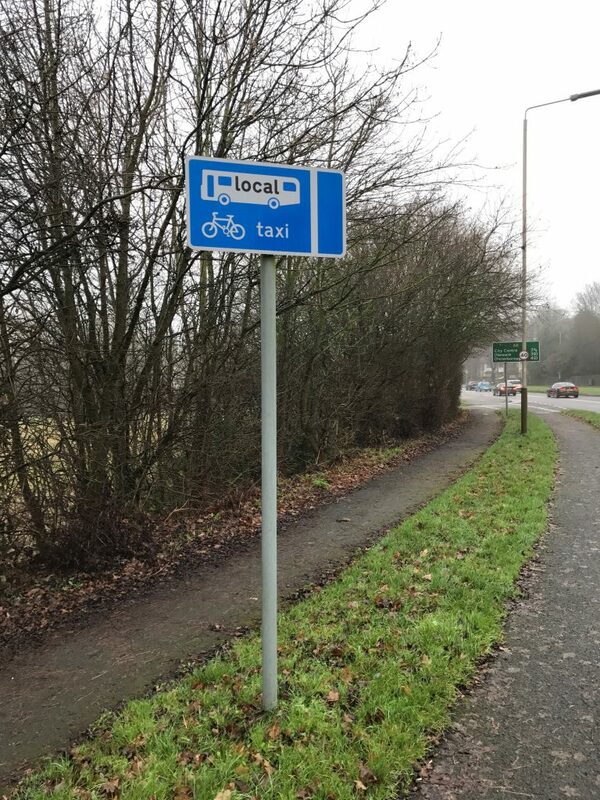 This road sign informs road uses that only local buses, taxis and push bikes can use the next bus lane. Unlike the sign above there are no times below the sign which means that this a 24hr bus lane that your not allowed to use at any time of the day. If you need to turn left you should only enter the bus lane when you reach the broken white line and markings direct you to the left. When the bus lane finishes, marked by the end of bus lane sign you should move back to learners left to allow faster moving traffic to pass unless you intend to turn right. If the sign reads “At Any Time” this is also a 24Hr bus lane that shouldn’t use. 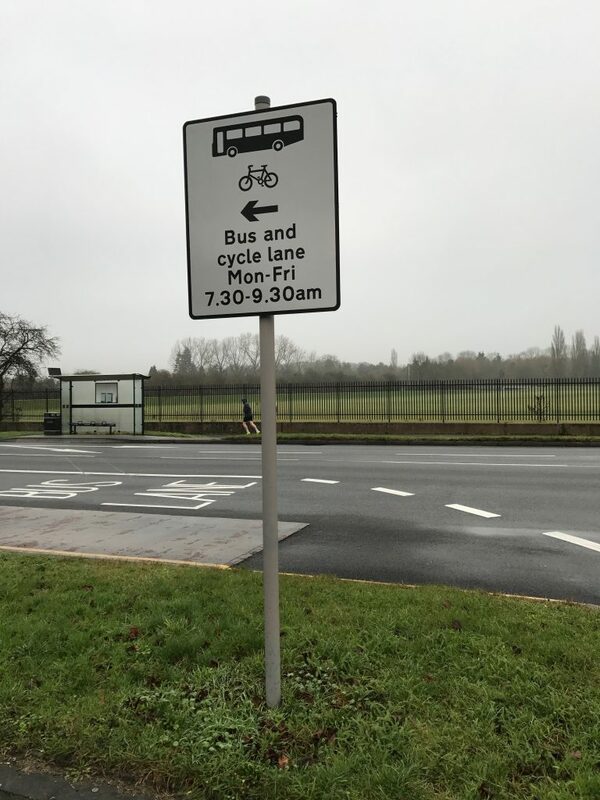 This road sign informs road users that the vehicles turning left aren’t allowed to use the bus lane between the hours of 7:30-9:30am Monday to Friday. This may be the only sign you see before turning into the next road so its vital to be observe the sign to know where to correctly position. The next video shows a vehicle travelling along the A6 towards Leicester from the Racecourse Roundabout. Use this video only as an example of how to correctly use this part of bus lane, you should always react to the situation in front of you. This particular section of road can be quite tricky due to it having to two bus lanes close together with different rules of operation, it highlights the need for good observations at all times. This second video shows a vehicle travelling along Saffron Lane to Aylestone Road and advises on the correct use of bus lanes. This section of the road is often used on driving tests from South Wigston test centre. Make sure you only use this video as an example you should always make your own decisions and read the road in front of you. Copyright © Rapide Driving School 2004 - 2019. All Rights Reserved.